The Shilka is the air defense system closest to the troops, having followed Soviet and Russian motorized infantry and tank battalions for five decades in which it also made its mark in ground engagements. There is a joke in the Russian military that air defense troops are failed pilots who don’t like anyone else flying. But not even these zealous forces could keep the skies completely clear in the post-war period. Anti-aircraft weapons available in the 1950s were not guaranteed to hit fast-flying targets, and rather laid down a screen of fire to ward off enemy planes from ground assets. Meanwhile, building on German knowhow captured in 1945, both the United States and the Soviet Union were busy developing the first anti-aircraft missiles. Designed to hit targets at medium and high altitudes, these still allowed enemy aircraft to fly below 300 meters with relative impunity. A new mobile artillery system capable of firing on the move was needed. The U.S. military was still using the M42A1 Duster, a tank-based anti-aircraft system with a twin-barrelled 40 mm gun. Work was also underway on the 20 mm M163 Vulcan system, which would be mounted on an armored personnel carrier. The Soviet Union also had two systems under simultaneous development, a 23 mm four-barrelled model and a 37 mm twin-barrelled rival, named the Shilka and Yenisei after Siberian rivers. The Shilka ZRK-23-4 won the race but still had some drawbacks. The caliber of ammunition wich used Yenisei was rare in the Soviet forces, and the 28-ton mass of the combined gun and carrier meant it had to be used with tank units. Another deciding factor in favor of Shilka was its efficiency against low-altitude and close-range targets. Firing 4,000 rounds a minute, the Shilka can hit aerial targets flying at 450 meters per second at an angled range of 2,500 meters or 2,000 meters vertically. Its guns can be sighted visually or by its radar, which automatically tracks targets and feeds data to its computer to generate pre-emptive firing coordinates. The tilt angle of the gun is also automatically set to compensate for any pitching of the vehicle when in motion. While well shielded from interference, the radar has a low range of only 6-12 miles, depending on weather conditions. This shortcoming was revealed during the Arab-Israeli wars of the 1960s and 1973. But although undertrained Syrian crews often preferred to sight the weapon visually, the Shilka is still credited with downing 16 of 117 aircraft shot down by Syrian air defense forces in 1973-1974. Despite already being obsolete by 1990, the Shilka also caused the loss of Western coalition aircraft during the First Gulf War by forcing pilots to act cautiously at low altitudes and make mistakes. But it did not only make its mark against airborne targets. The sheer intensity of fire produced by the towed version of the gun was valued by guerrilla forces around the world. In 1975, the weapon saw action in Angola, when a handful of Cubans used it to halt the combined advance of fighters of FLEC (Front for the Liberation of the Enclave of Cabinda) and regular Zaire Army units. After mining the roadside, they opened fire from pre-prepared positions and wiped out an entire enemy convoy. 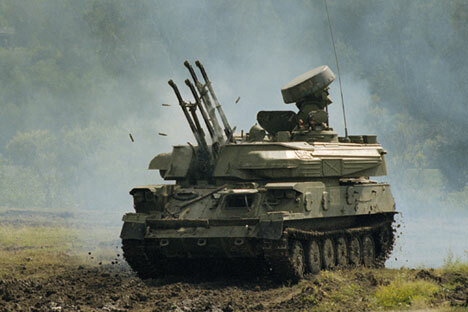 The Shilka also fought with devastating effect in the wars in Chechnya. The former head of the North Caucasus military district, Lieutenant-General Vladimir Potapov, noted its high efficiency against enemy strongholds and firing points. “Perfected in street fighting, the tactic of using the Shilka when facing strong enemy resistance is to drive the vehicle out from behind cover, give long bursts of fire and immediately pull back,” Potapov wrote in an assessment of combat results. Meanwhile, inherent weaknesses like the limited effective firing range against aerial targets, insufficient ammunition power and the radar’s shortcomings were eliminated in three upgrades over half a century. Today the Shilka is still in service with 39 countries. It was also used in the 1980s to develop the Tunguska air defense system, the forerunner of the contemporary Pantsir-S1, which is armed with short- to medium-range surface-to-air missiles and an anti-aircraft artillery system.